A picture may be worth a thousand words, but a positive patient review is invaluable. Easily capture and highlight positive patient reviews to increase credibility and build trust. Now, you can easily stay on top of patient reviews. Reputation Marketing for dentists allows you to remain in control of patient reviews, showcasing your most positive reviews to prospective patients right on your website. 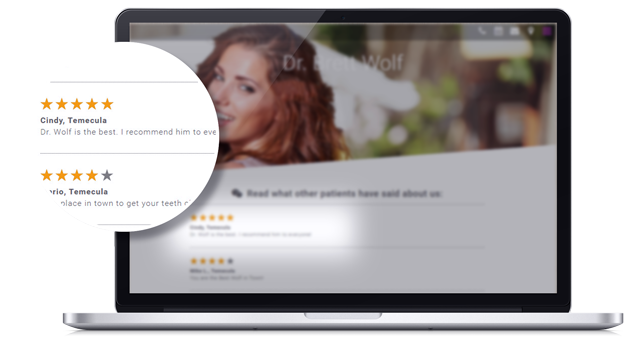 With Reputation Marketing, a Patient Reviews page and corresponding navigation tab are added to your dental practice’s website. Patients simply click the tab in your navigation bar to be taken to a page with a star rating system and a comment box. It couldn’t be easier! Reputation Marketing allows you to leverage patient reviews with the click of a button. 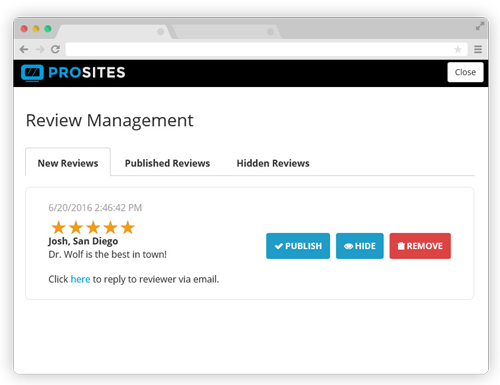 With our convenient Review Manager, you select which reviews you want to publish to your website, revisit at a later time, or remove altogether. You remain in control - reviews aren't posted on your website unless you hit ‘Publish'. Our Reputation Marketing for dentists helps take reviews beyond your website by making it easy for patients to spread the word. 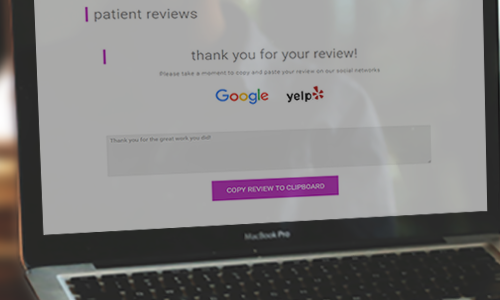 When patients rank their experience 4+ stars, they're automatically prompted to share their review on popular review networks such as Google+, Yelp, and Bing, which also makes you more visible to prospective patients. 1. From Futuredontics' Whitepaper "What Dental Patients Want" ? Learn more about managing your online reputation. Get a free demo to see how Reputation Marketing makes it easy for you to monitor and garner more positive reviews. Fill out the form or call us today at (888) 932-3644.